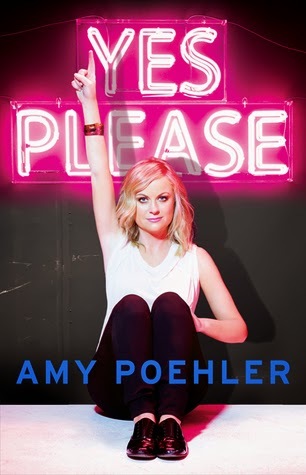 Yes Please is a memoir self-authored by SNL actress, writer, and comedian Amy Poehler. When I say it's sort of a memoir, I mean that it is autobiographical in nature and there are mentions of Poehler's personal life--however, she does not dive deep into detail about her life. The parts of her life that she talks about, she does so matter-of-factly and briefly before moving onto the next topic. In addition to this, there are sections that she hands over to other people in her life in order that they might weigh in on her ideas...or maybe just because she was tired one night and needed additional chapters, she she handed the reins over to Seth Meyers and Mike Schur who give some outside perspective about what working with Poehler and being her friend is like. "It is called Yes Please because it is a constant struggle and often the right answer. Can we figure out what we want, ask for it, and stop talking? Yes Please. Is being vulnerable a power position? Yes please. Am I allowed to take up space? Yes please. Would you like to be left alone? Yes please. I love saying "yes" and I love saying "please." Saying "yes" doesn't mean I don't know how to say no, and saying "please" doesn't mean I am waiting for permission. "Yes please" sounds powerful and concise. It's a response and a request. It is not about being a good girl; it is about being a real woman. It's also a title I can tell my kids. I like when they say "yes please" because most people are rude and nice manners are the secret key to the universe." And lest you think that this book lacks the comedic wit and lightheartedness of other comedic biographical works--if you listen to the audiobook, Poehler turns the narration briefly over to Sir Patrick Stewart in a section containing haiku about plastic surgery. The whole book is layered with Poehler's wit and comedic timing, even though it is more of a life-advice book than a memoir. It's what makes it stand out from other comedic memoirs. Basically, I read this book as a how-to manual on how to become Amy Poehler. And I can think of way worse things to be. Yes Please by Amy Poehler is available at the Ocean City Free Public Library.